Apache are looking to sharpen up your wardrobe with Farah Vintage clothing. Farah Vintage takes it’s style from parts of our British heritage, and then remixes it with a helter-skelter kind of approach inspired from subcultures across the board. Farah clothing reads like no other, with their outstanding layering of prints on prints and their sharply cut tailoring. From their birth in the 1920’s, the Farah Vintage brand has been renowned for their classic take on polo shirts. The oh so dapper Lester Textured Front Polo Shirt is one of many to retain its heritage of slim fitting polo tops and this one’s available in an array of colours from Apache Online. 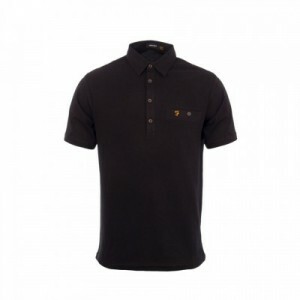 It features a tailored collar with an extended four-button placket, and an elegantly embroidered Farah logo. This Farah Vintage polo bridges high-end fabrication with a vintage-inspired design, ideal if you’re aiming for the smart-casual look. The jacquard tailored collar and welted left chest pocket are just a few details that sets this polo shirt apart. 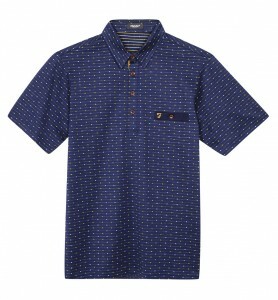 The design of the Rafi Dobby Polo Shirt also presents a repeat dotted pattern print, complimented by a contrast navy chest pocket and an extended four-button placket. It’s the perfect balance of classic vs contemporary. Put simply, it’s the don of all polos. Updating a classic style is the Button Down Oxford Shirt from the Farah clothing vintage collection. The long-sleeve slim-fit Farah Vintage shirt is crafted using pure cotton fabrication. 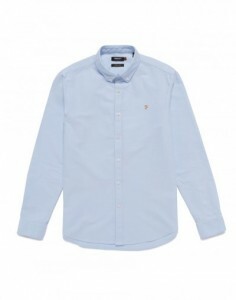 It also features a button down collar helping you ace that smart ‘n’ sharp style. The Farah Vintage Oxford Shirt is a perfect compliment to a whole choice of trousers, whether it be your favourite pair of slim jeans, chinos or a pair of shorts (weather permitting of course). Explore the full Farah Vintage clothing range from Apache Online, UK.